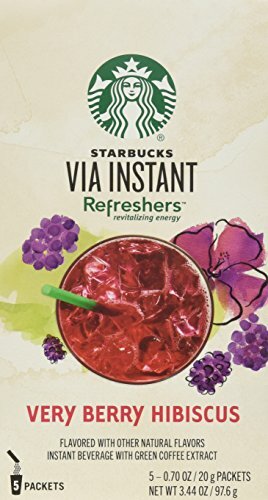 Starbucks VIA Refreshers Very Berry Hibiscus combines tangy blackberry with hints of hibiscus, sweet ginger and lemongrass, and pairs that with the natural energy from green coffee extract. 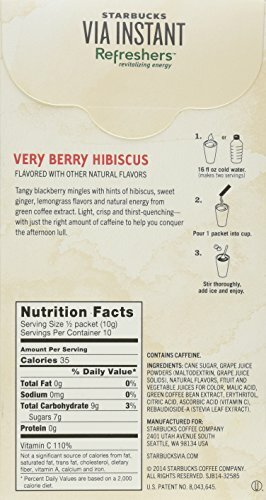 It's a breakthrough in instant refreshment that tastes nothing like coffee. Light, juicy and thirst-quenching, with a natural boost of caffeine. Enjoy Starbucks VIA Refreshers wherever the moment takes you. 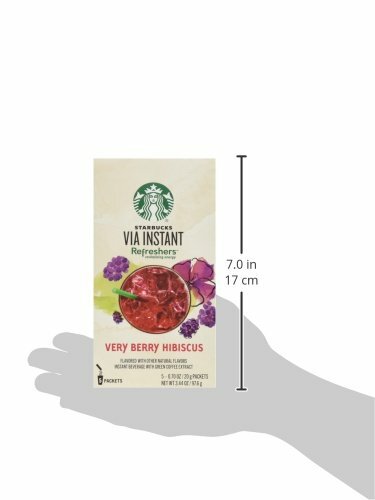 5 packets included, each packet makes a 16 fl oz drink. Net weight 3.44 oz. Tasting Notes: tangy fruit, sweet ginger and lemongrass. Enjoy this with a cheese and fruit plate for an easy summer picnic. Just add cold water, stir and enjoy!